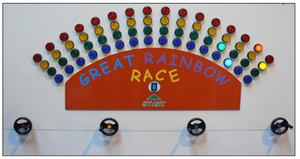 Start the one- to four-person race then spin the wheels as fast as you can to generate the speed to move the lights along – see which colour wins! Indoor Use Only. Power supply required.